It has always struck me how Western yoga peeps are afraid of the word “guru.” I’ve gotten into it with a well-known yoga blogger about the use of the word guru, her argument being that somehow there is something inherently bad or negative about the word. We give words their power. There are different definitions for guru: venerable, weighty, teacher, dispeller of darkness. In Buddhism a guru is seen as a teacher or a spiritual friend. So many connotations on such a simple word yet so many problems associated with it. That’s what happens when we look outside ourselves for our identity. We become lost and confused. I was happy to be in India when the John Friend scandal broke. Yawn. That’s when the discussions of guru began. I have no problem with so many seemingly intelligent people calling him a guru. But I think the entire debacle raises questions on WHY so many people got hood-winked. What does that say about them? What were THEY lacking in their lives that they entrusted their identities, indeed their yoga souls, to someone like Friend? People can argue that we all have the need to belong to a group, we all need to feel wanted, praised, loved, but at what price? Just because the Kula Kids gave up their identities to a charismatic charletan, does not make the concept of guru bad. I have been called a guru, albeit in India, and I don’t have an entourage like Friend. When I am in India and people find out I am a yoga teacher they automatically ask “who is your guru?” People have touched my feet in India, especially at the Kumbh Mela. I know that would shock people here and the first time it happened I was taken aback, but I realized, that’s what people do. I did not automatically think that I am any more special or more important than they are. Kausthub Desikachar spoke to us twice during my training this month and he spoke about the teacher-student relationship. He said yoga students should look for a teacher who has a current relationship with a teacher, but to focus on the teachings, not the teacher. He told us that people would always tell him how wonderful it is to have Desikachar as a father, how wonderful it must have been to have Krishnamacharya for a grandfather, that they must have been the perfect teachers. He told us, no, they were not perfect men, they were not perfect teachers, but they were passionate about the teachings, that the teachings of yoga are much more important than Krishnamacharya or Desikachar. Kausthub said that if one reads the Sutra-s carefully, Patanjali did not say if we practice authentic yoga that we will not have any problems, we will only have less klesas. Freedom is not about being perfect, it’s about making friends with your imperfections. I read on a yoga teacher’s website the other day that she is an “expert in all things yoga.” Wow. Does that make her a guru? Instead of wanting to learn more about her, that makes me run like hell. I have never heard the teachers at the Krishnamacharya Yoga Mandiram say they were experts in anything. In fact, in spite of some of them studying with Desikachar for 10 or more years, during my training they said they are still learning from him, from each other, and from us, the students who come to sit at their feet. Humility bespeaks a true yogi. So put down that smartphone, look someone in the eye, and listen mindfully next time they speak to you. That person might be your next guru. Not the rock star yoga teacher you idolize at the yoga conference, not the yoga teacher you pay thousands of dollars to for a teacher training, but your next door neighbor. Or a homeless person. Or a domestic violence survivor. I am blessed with serendipitious meetings when I am India and one of them was during my last weekend in India. In a land where even the beggars have cell phones, this man does not have one. He does not do email and he did not know what Wikipedia was until I told him. He is a wealthy man, a movie distributor whose father was a famous film director in 1950s Bollywood and whose mother was a well-known musician who played at Woodstock. Yet, one of the most unassuming men I have ever met. We talked about the cell phone phenomena, about how people feel lost without them, AS IF constantly checking emails and Facebook and Twitter gives them their identity. He said, “I see people all the time in restaurants, they are out together but not talking, they’re always checking their phones. Nincompoops.” He said they were missing life, missing connecting with someone who could be their teacher. A guru. My friend said he does not allow people to make or receive calls when they are in his flat, only in emergencies, only if it is an absolute necessity. He makes them go outside because he finds it rude and distracting. This, in a country where there are more cell phones than toilets. I’ve decided that next time I am talking with someone who is more interested in swiping their smartphone or checking Google Maps, I’m going to stop talking and wait for them to practice mindful listening. We spent 17 hours together during my last weekend in India. No computers, no phones — only walking, talking, drinking tea. 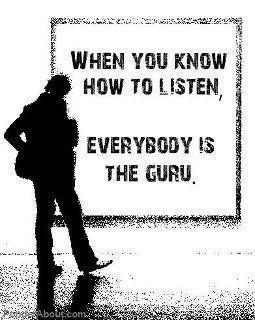 And always mindfully listening to each other’s guru. Because you never know who that might be. Previous Post back in the U.S.A.
Oh great post!! I think cultural context is always important when looking at ideas like “guru” or “priest”. It can mean many different things depending on the environment and cultural context in which the idea is being utilized. my thing is that I may have been born into my culture, but I have learned that I am not OF my culture….makes things hard sometimes…..stranger in a yoga strangeland. A wonderful, inspiring essay. thank-you, Linda. Here’s a paragraph from an essay written by Charlotte Bell, ( a humble, inspiring yoga teacher from salt lake) that also speaks to (or warns about!) yoga teachers that consider themselves ‘experts’. “Each time I step onto my mat there is potential to learn something new. What is most helpful, more than a strong or flexible body, is what Zen master Suzuki Roshi called “beginner’s mind.” In his classic book, Zen Mind, Beginner’s Mind, he says, “In the beginner’s mind there are many possibilities. In the expert’s mind, there are few.” The mind that does not know is curious and open to explore what is being presented in the moment. The mind that knows all, or the body that has attained “perfect” asana, does not need to look further. When I practice from beginner’s mind, it does not matter how many times I’ve placed my body in the shape of triangle; there is always potential for joyous discovery. My inspiration to practice lies in the fact that there’s always something new to learn. thanks Linda, really enjoying your blog again now you are back! Great post Linda-Sama…thanks. I agree the teachings are more important than the guru. Just last week I was at a kirtan with Dave Stringer who said “Guru is a principle not a person”…not sure if that makes it more palatable for us Western Sramanas but it made sense to me at the time. But hopefully it’s a principle without a mobile phone! Love this post! I always just thought guru meant teacher in another language, but I guess many people attach a certain “ooooooooh” factor to the name “guru” and start to worship the guru like a god or an idol. That becomes an obsession. There’s a line between respect and worship, which apparently is not very clear and people often get confused. Beautiful. I love that long conversation you had with the movie distributor man! That’s so refreshing, and as you say what a wonderful teaching. I know you’re not as much of a fan of technology as I am, but I was chatting on Twitter just the other day with another yoga teacher (not even sure how we connected) but we were talking about this – how the teachings (and students) teach us. How there’s no real difference between practicing and teaching except for one’s focus. But it’s all the same thing. Or it should be, if your attention and intentions are in the right place. This is a great post Linda! It seems to me that a real dispeller of darkness is really one in a million… But so many people (imperfect, human people) can be our teacher, if we are open to what they have to teach. I didn’t follow the John Friend (Bill Clinton anyone?) “scandal” nor do I intend to… but I also think that even people who fall off the pedestal can still be great teachers. As you say – it is about the teachings, not the teacher’s “perfection”. Thanks for stopping by again, LaGitane….have missed your comments! iPhone, iPad, iTouch…..iBad !! Am not one bit a gadget person. Seriously, I do believe in finding Divinity in every human being. Every being, someday. But to begin with, at least every human being. And gadgets are certainly not necessary to do that.